A White-throated Sparrow was seen near Pipers Lagoon in Nanaimo. The Sunday Bird Walk went to the Nanaimo River Estuary in Nanaimo. Twenty-three birders found the following twenty-seven species: Double-crested Cormorant, Turkey Vulture, Cooper's Hawk, Sharp-shinned Hawk, Merlin. Great Blue Heron, Canada Goose, Mallard, Least Sandpiper, Glaucous-winged Gull, Anna's Hummingbird, Belted Kingfisher, Rock Pigeon, Northwestern Crow, Common Raven, Bewick's Wren, American Robin, Violet-green Swallow, Barn Swallow, European Starling, Red Crossbill, House Finch, Purple Finch, Savannah Sparrow, White-crowned Sparrow, American Goldfinch and Pine Siskin. A Stilt Sandpiper, Greater Yellowlegs, Western and Least Sandpiper were seen along French Creek. A Heermann's Gull was seen at Columbia Beach. A Ruff was observed feeding along the tide line at high tide between 4:00 pm and 5:30 pm with Least Sandpipers, a Sanderling, Black Turnstone and Killdeer. 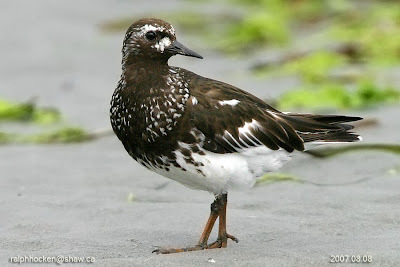 It was last seen roosting on the Gravel Bar in front of the Pebble Beach Townhouses at Columbia Beach. A Green Heron was spotted at the Upper Lake at Colliery Dam Park in Nanaimo. A Ruff was seen again at Columbia Beach off Johnstone Road. A Common Tern (a unusual sighting for this area) was also seen in the same area. An Anna's Hummingbird was seen in the 100 block of Pirates Lane on Protection Island. An Eurasian bird, a Ruff, was seen at Columbia Beach, at the end of Johnstone Road off highway 19a. A Cedar Waxwing was seen in Duncan just opposite the Whippletree Junction. A second summer/winter Yellow-billed Loon was seen just off the waterfront in Qualicum Beach. A Barred Owl was seen in a yard along Forest Crescent in Nanaimo. Two Wandering Tattlers were seen on the pebbly beach at the water's edge about two blocks from the ferry terminal at Port McNeil. California Quail were seen along Finholm Street in Parksville. Monday, September 24, 2007@ 7:30 pm. There will be no Sunday Bird Walk on September 02, 2007. The Sunday Bird Walks will resume on September 09, 2007. 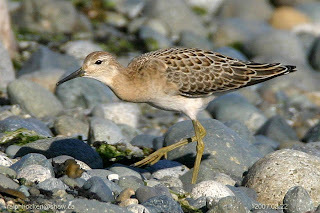 A RUFF, an Asian bird, was reported last Tuesday at Columbia Beach near French Creek. This rare but regular Eurasian visitor is found feeding along the tide lines. He was last seen at about 5:30 pm today, August 23, with it's bill tucked into it's right wing on a gravel bar just off shore in front of the Pebble Beach Condos at Columbia Beach. The Sunday Bird Walk went to Neck Point Park in Nanaimo. Five birders found the following thirty-three species: Surf Scoter, Double-crested Cormorant, Pelagic Cormorant, Brandt's Cormorant, Common Loon, Turkey Vulture, Bald Eagle, Great Blue Heron, Spotted Sandpiper, Western Sandpiper, California Gull, Glaucous-winged Gull, Pigeon Guillemot, Marbled Murrelet, Anna's Hummingbird, Belted Kingfisher, Northern Flicker, Northwestern Crow, Common Raven, Bewick's Wren, Winter Wren, Chestnut-backed Chickadee, Red-breasted Nuthatch, Swainson's Thrush, American Robin, European Starling, Orange-crowned Warbler, Golden-crowned Kinglet, Spotted Towhee, Red Crossbill, House Finch, American Goldfinch and Pine Siskin. Two Clark's Grebes in breeding plummage were seen off shore at Port Renfew. A Common Eider was spotted flying very fast along the strait of Juan de Fuca. A juvenile Black-headed Grosbeak were seen visiting feeders at the corner of Lantzville and Superior Roads in Lantzville. A Sharp-shinned Hawk was perched on a fence, keeping a lookout on the birdfeeders, in the 100 block of Meridian Way in Parksville. 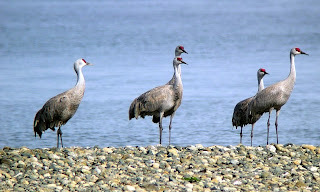 Over one hundred Sandhill Cranes were seen landing in the Estuary in Courtenay. A Barred Owl was spotted perched in an arbutus tree at Pipers Park, next to the Museum, in downtown Nanaimo. Six Black Swifts were seen over Ladysmith. Four Red Crossbills, an Olive-sided Flycatcher and a Willow Flycatcher were spotted at Chemainus Lake. A family of Black-headed Grosbeaks were spotted at the Pulp Stone Quarry on Newcastle Island. Four Cedar Waxwings were seen at Morrell Wildlife Sanctuary in Nanaimo. A Common Eider, was observed moving very quickly just above the water, along Columbia Beach not far from the tide line. The Sunday Bird Walk on August 26, 2007 will be going to the Nanaimo River Estuary. The fall migration is under way and yesterday Tuesday August 14, 2007, we received a report of approximately 100 Sandhill Cranes seen at the Courtney Estuary. Also watch for Least and Western Sandpipers, yellowlegs and loons. In the backyards watch for the birds to begin flocking, such as with the Chestnut-back Chickadees and for other to begin changing plumage like the American Goldfinch and the starlings. If you have any sightings to report email or call the Nanaimo bird alert at 250-390-3029. Canada Goose, Mallard, Northern Shoveler, Surf Scoter, Red-breasted Merganser, Pelagic Cormorant, Great Blue Heron, Common Murre, Marbled Murrelet, Rhinoceros Auklet, Common Loon, Red-neck Grebe, Bald Eagle, Cooper's Hawk, Turkey Vulture, Killdeer, Sanderling, Least Sandpiper, Western Sandpiper, Mew Gull, California Gull, Glaucous-winged Gull, Bonapart's Gull, Pigeon Guillemot, Belted Kingfisher, Black Swift, Vaux's Swift, Northern Flicker, Northwestern Crow, Chestnut-backed Chickadee, Willow Flycatcher, Huttons Vireo, Warbling Vireo, Black-throated Gray Warbler, Red-breasted Nuthatch, Bewick's Wren, American Robin, European Starling, Spotted Towhee, Song Sparrow, Red Crossbill, Purple Finch, and House Sparrow. Eight Red Crossbills were spotted sitting on the mudflats at the end of Benwaldun Road in Lantzville. Two hundred Black-bellied Plovers, twelve Black Turnstones, Ring-billed Gulls and two Mew Gulls were seen at Columbia Beach. A Lesser Yellowlegs, five Greater Yellowlegs, three Lesser Sandpipers and three Belted Kingfishers were seen along the French Creek estuary. A flock of Hutton's Vireos were seen near the Beaver Ponds at Nanoose Bay. A Peregrine Falcon and a Red-tailed Hawk was seen at the Englishman River Estuary, Shelly Road side. Bon Voyage to Marion and Peter Coxon as they wing their back to Australia after spending six months in the Pacific Northwest exploring our part of the world. They were in our area for seven weeks. We will miss your Auzzie sense of humour and great birding talents. It was a joy to spend time with you! The Sunday Bird Walk on August 19, 2007 will be going to Neck Point Park in Nanaimo. Meet at the Bird Store at 9:00 a.m. or at the parking lot at Neck Point Park off Hammond Bay Road about 9:15 a.m.
Rufous Hummingbird, Belted Kingfisher, Northern Flicker, Northwestern Crow, Chestnut-backed Chickadee, Brown Creeper, American Robin, European Starling, Spotted Towhee, Song Sparrow, House Finch, Pine Siskin and House Sparrow. Three Barred Owls were seen and heard along Kilpatrick Road off Jingle Pot Road in Nanaimo. Two low flying Osprey were seen over the 2500 block of Glenayr Drive in Nanaimo. Several Common Nighthawks were seen over the downtown area of Nanaimo. 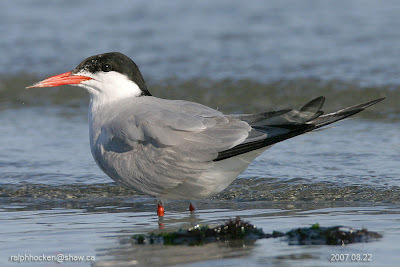 A Caspian Tern and a Heerman's Gull were seen at Columbia Beach. Over seventy Common Nighthawks and several Black Swifts were seen above Highway 19a in Parksville. One Common Nighthawk and ten Cedar Waxwings were seen along the Rivers Edge area behind the Weigh Scale at Parksville. A Barred Owl was spotted at Morrell Sanctuary in Nanaimo. Red Crossbill, Black-headed Grosbeak, Black Swift and Common Nighthawk were seen at the Willow Mobile Park in Nanaimo. A Great Horned Owl was seen in the 4200 block of Clubhouse Drive in Nanaimo. 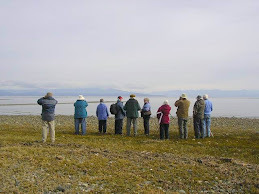 The Sunday Bird Walk on August 12, 2007 will be going to the Englishman River Estuary, Plummer Road side in Parksville. Meet at the Bird Store at 9:00 a.m. or at the corner of Plummer Road and Shorewood Drive in Parksville at about 9:30 a.m.